Large flowers, great perfume and easy care, Daphne ‘Perfume Princess’ is a new release hybrid, better suited to sunny positions than most other varieties. Taking the best from D. odora D. bhoula Perfume princess is blessed with large flowers, it was bred in New Zealand by Mark Dury. 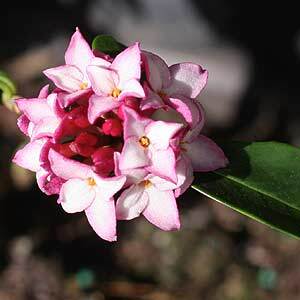 It is a Daphne that grows well in full sun and will cope with warmer climates such as Sydney and Brisbane, these characteristics it gets from one parent D. bhoula. The flowers are large and very fragrant, larger than D.odora, however we are not sure that they are any more fragrant. Not having grown Daphne ‘Perfume Princess’ through a hot summer, we can not vouch for the ‘grow in full sun without leaf burn’ claims. This is an excellent Daphne for container or garden and we now have two growing happily in our garden. Our other Daphnes still provide us with great fragrance, and in our opinion flower earlier in the season, however Daphne ‘Perfume Princess’ seems to flower for longer. This is a plant that will reach a height of around 1m with a similar spread, Daphne ‘Perfume Princess’ is best in a sunny position however we would choose a spot with some protection from the hot afternoon sun. Amend soil by digging in lots of well rotted compost. Make sure that the soil is well drained. If you need to add some organic composted material and some sharp or gritty sand, this will open up the soil and improve the drainage. Add some blood and Bone and a little lime. Plant the Daphne a little higher than the surrounding soil and hill up around it.